The long-awaited answer has arrived: Saquon Barkley is the 2018-19 Offensive Rookie of the Year. 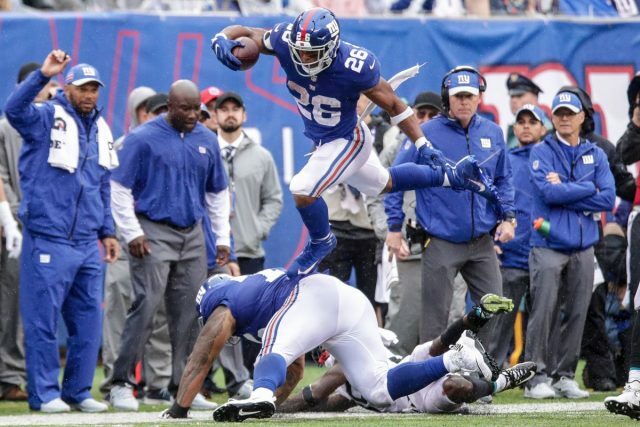 The second overall pick in last year’s NFL Draft came out guns blazing for a New York Giants team that, quite frankly, underperformed for much of the season. While many believed him to be the NFL-equivalent of Adam Dunn –– meaning a ton of home run plays, but will strike out a lot, Barkley amazed for much of the season. His 2,028 yards from scrimmage did not just beat all rookies, he also led the NFL in that regard. On top of that, his 1,307 yards rushing was good for second in the NFL behind Ezequiel Elliott who finished with 1,434 with Dallas. Barkley also came in fifth in the NFL with 11 rushing touchdowns. Oh, and the Penn State alum didn’t fumble a single time between 261 rushes and 91 receptions in 2018. The runner-up to Barkley this season was Browns quarterback Baker Mayfield. Yes, you read that right. The Browns quarterback finished second in the running for offensive rookie of the year honors. Despite being the number one overall pick last season, there was a lot of doubt regarding what role the ex-Sooner would have in Cleveland this season. Considering the team had already acquired Tyrod Taylor, and was in pretty decent position to make a run at the playoffs with the likes of Jarvis Landry, David Njoku, and rookie Nick Chubb on the offensive side of the ball. However, Mayfield’s coming out party came in Week 3 against the Jets following a concussion to Taylor. Much like all-time great Tom Brady, Mayfield never relinquished that spot. He actually went on to set the NFL rookie record with 27 touchdown passes and led the Browns to a 6-7 record in his starts.